Parasites can come in many forms and all can do different harm to the human body. Some parasites can be fatal or chronic but some can be treated and cured. Anyone can get infected with a parasite anywhere in the world and never know it. You can get a parasite from ingesting it in food or water, breathing it in, through skin contact and more. Even a scratch from a house cat can give you all kinds of different things such as Bartonella or Hookworms. Below was taken from the National Institute of Allergies and Infectious Disease. Roundworms, or nematodes, are a group of invertebrates (animals having no backbone) with long, round bodies. They range in size from those that can be seen by the naked eye to those several hundredths of an inch long that can only be seen under a microscope. Parasitic roundworms can live on or in humans where they can cause a variety of health problems. Most parasitic roundworm eggs or larvae (immature form) are found in the soil and enter the human body when a person picks them up on the hands and then transfers them to the mouth. The eggs or larvae also can enter the human body directly through the skin. With the exception of the parasitic roundworm that causes trichinosis, mature adult roundworms eventually end up or live in human intestines and cause infection and disease. In trichinosis, it is the movement of the larvae through the body from the intestines and their encystment (becoming enclosed in a capsule) in muscle tissue that create serious problems. Parasitic roundworms that infect humans are much more widespread than many of us realize. Diseases caused by these parasites affect not only poverty-stricken individuals in developing or remote areas of the world, but they also can be important health problems for people throughout the world, including in the United States. As with other parasitic diseases, roundworm infections in the intestines are more common in warm climates than in cooler, temperate areas. The best solution is to try to prevent these diseases rather than treat or cure them. School-age children are particularly at risk for parasitic roundworm infections. The parasitic roundworms consume nutrients (nourishing materials) from the children, which can contribute to malnutrition and developmental problems. An estimated 576-740 million people in the world are infected with hookworm. Hookworm was once widespread in the United States, particularly in the southeastern region, but improvements in living conditions have greatly reduced hookworm infections. Hookworm, Ascaris, and whipworm are known as soil-transmitted helminths (parasitic worms). Together, they account for a major burden of disease worldwide. Hookworms live in the small intestine. Hookworm eggs are passed in the feces of an infected person. If the infected person defecates outside (near bushes, in a garden, or field) of if the feces of an infected person are used as fertilizer, eggs are deposited on soil. They can then mature and hatch, releasing larvae (immature worms). The larvae mature into a form that can penetrate the skin of humans. Hookworm infection is mainly acquired by walking barefoot on contaminated soil. One kind of hookworm can also be transmitted through the ingestion of larvae. Most people infected with hookworms have no symptoms. Some have gastrointestinal symptoms, especially persons who are infected for the first time. The most serious effects of hookworm infection are blood loss leading to anemia, in addition to protein loss. Hookworm infections are treatable with medication prescribed by your health care provider. 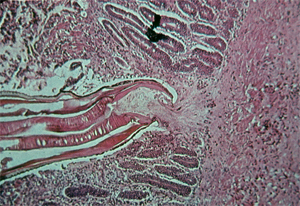 Highly magnified histologic section showing hookworm (Ancylostoma sp) attached to the intestine. High-intensity hookworm infections occur among both school-age children and adults, unlike the soil-transmitted helminths Ascaris and whipworm. High-intensity infections with these worms are less common among adults. The most serious effects of hookworm infection are the development of anemia and protein deficiency caused by blood loss at the site of the intestinal attachment of the adult worms. When children are continuously infected by many worms, the loss of iron and protein can retard growth and mental development. The human hookworms include the nematode species, Ancylostoma duodenale and Necator americanus. Eggs are passed in the stool , and under favorable conditions (moisture, warmth, shade), larvae hatch in 1 to 2 days. The released rhabditiform larvae grow in the feces and/or the soil , and after 5 to 10 days (and two molts) they become filariform (third-stage) larvae that are infective . These infective larvae can survive 3 to 4 weeks in favorable environmental conditions. On contact with the human host, the larvae penetrate the skin and are carried through the blood vessels to the heart and then to the lungs. They penetrate into the pulmonary alveoli, ascend the bronchial tree to the pharynx, and are swallowed . The larvae reach the small intestine, where they reside and mature into adults. Adult worms live in the lumen of the small intestine, where they attach to the intestinal wall with resultant blood loss by the host . Most adult worms are eliminated in 1 to 2 years, but the longevity may reach several years. Some A. duodenale larvae, following penetration of the host skin, can become dormant (in the intestine or muscle). In addition, infection by A. duodenale may probably also occur by the oral and transmammary route. N. americanus, however, requires a transpulmonary migration phase. Anthelminthic medications (drugs that rid the body of parasitic worms), such as albendazole and mebendazole, are the drugs of choice for treatment of hookworm infections. Infections are generally treated for 1-3 days. The recommended medications are effective and appear to have few side effects. Iron supplements may also be prescribed if the infected person has anemia.